Well, it's the Wednesday before Christmas and my desk pretty much shows it! There is an over abundance of red and green on that thing at the moment along with the Design Team goodies that have arrived over the last week or so that I need to dive into yet. It's a bit on the crazy side, to be honest with you! Ok. Fine. I admit it. It's just plain nuts! HA! I also wanted to share a quick card with you. I created this one using the awesome Cling Jumbo Sparkle Joy set from Stampendous! 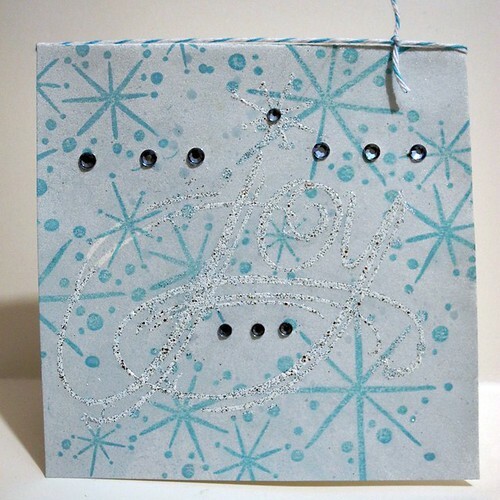 I stamped the sparkle on the background in ocean breeze ink and then stamped Joy in VersaMark and embossed it with the Shabby Blue Embossing Powder. I then sprayed a blue mist over the entire card before adding the rhinestones and the twine. Oh...so you know how I said I was pretty much done with my shopping? Yeah, well, as it turns out I don't like being done with my shopping. I like having last minute things to buy ...well, at. the. last. minute. Just say'n. I've decided that I'm not done. The Hubbums seems to think this is ridiculous. He might not be entirely wrong on that, but at least it's FUN!!!! YAY!!!! Tee-hee. And...Happy Hanukkah, everyone! The Festival of Lights officially began at sundown yesterday. Oh...and Happy Winter Solstice, too....for me, this means one thing in particular...welcome to the days FINALLY starting to get longer! THAT, my friends, makes me happy. Just say'n. Oh...and to check out more fabulous workspaces head on over to Julia's blog! It's fun! I'm usually "done" with Christmas shopping early, and then go in for a last minute frenzy of pretty little things and stocking stuffers. It just makes me feel the spirit. Your desk looks like a fun place! !The silver Joy is fabulous. Wishing you a beautiful Christmas and a very happy 2o12! great card! love all the sparkle! Ooooh, I'm loving that 'joy' on your card. It's almost hidden! Looks like you're a busy crafter! Love the card. Your card looks great - love the sparkle. I'm looking forward to longer days too!!! Great desk, and I like buying last minute bits too - but won't be this year!! Hope you have a great Christmas. ps be sure to check out my blog candy. Love this joy card! Love the glitter!! I know all about an overcrowded table top!! Merry Christmas! Happy (not merry) christmas Ho! Ho! Ho! I liked your comment about lots of red and green on your desk and the main item to focus on is the red tape dispenser! And the green handled scissors. Lots of fun going on in that mess. Love your snowflake card! :) And Happy Solstice! I too seem to enjoy last minute shopping. I have been done shopping (in years past) real early, then just end up getting extras for the sake of shopping, lol. If your Christmas is as colourful, energetic and creative as your makes - well it'll be a fun ride! Thanks for sharing in such a busy week! Hope you have a very festive and wonderfully merry time - see you in 2012! Sarah at 11. Hello, Jingle! I'm dropping by to greet you and your loved ones a joyful and blessed Hanukkah/Christmas season! 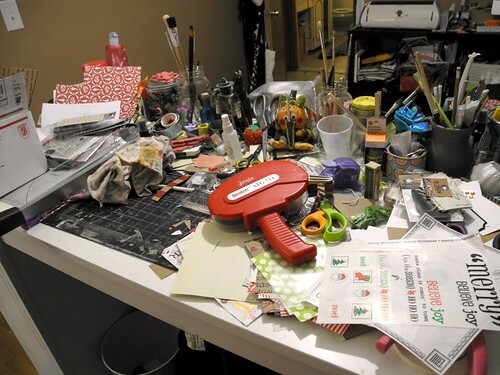 LOL, your desk is nice and Festive messy today! Thanks for sharing your life and projects with us in your blog! Yeah Jingle, longer days makes me happy too, am not good at winter!! Your desk looks great, love the dotty green and Christmas icons I can see. Am late, but not so late I can't wish you a happy Christmas.